In the era of computational genomics, a great deal of progress has been made in determining the relationships between genetic information and the development of multicellular organisms: plants, animals, humans. But what’s become most clear from this research is that all these organisms owe meaningful aspects of their development and phenotype to interactions with the microorganisms—bacteria or fungi—with which they live in symbiosis. Those microbes are an integral part of, and are affected by, our environment. As such, the individual microbiome—whether it lives on the skin, gut, mouth or elsewhere—manifests the continuum between organism and environment. It is a powerful tool for studying the impact of the environment on humans, and ultimately a vector with which to intervene through engineered landscapes. Within architecture the primary recognition of microbes has been in their role as pathogens. 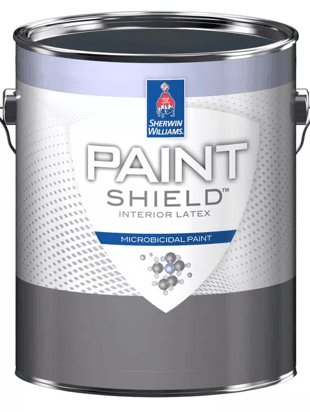 Building materials are treated to diminish anything microbial, and like antibiotics these methods are non-selective; they might kill the pathogens, but they also kill microbes that are beneficial to human survival and well-being. Most of the time, however, the vast microbial kingdom is simply neglected. It’s not a part of the plan. Turnbaugh, P. J., Ley, R. E., Mahowald, M. A., Magrini, V., Mardis, E. R., & Gordon, J. I. (2006). An obesity-associated gut microbiome with increased capacity for energy harvest. Nature, 444(7122), 1027–131. Cryan, J. F., & Dinan, T. G. (2012). Mind-altering microorganisms: the impact of the gut microbiota on brain and behaviour. Nature Reviews Neuroscience, 13(10), 701–712. Köberl, M., Schmidt, R., Ramadan, E. M., Bauer, R., & Berg, G. (2013). The microbiome of medicinal plants: diversity and importance for plant growth, quality and health. Frontiers in Microbiology, 4.
, both traits formerly thought to depend only on the plant’s genotype. Responsible design for multicellular inhabitants (like humans) needs to take these microbes into account. These simple organisms determine our phenotype in ways that are far more consequential than any designer can hope to address through material or form. This doesn’t mean that urban designers will be working directly with microbes. Rather, they need to understand how their design decisions will shape the ecosystem of microbes that emerge, thrive, or perish as a result of their creations/interventions. Most designers’ architectonic palette is composed of materials and forms, or parametric systems that shape materials and forms. These choices have historically been optimized to particular metrics, usually those of human comfort (e.g., 19 degrees Celsius.) Designers have not designed for the rest of the ecosystem, even as we increasingly discover that that ecosystem is inseparable from us. Although it’s far from fully understood, contemporary research can conclude that human health is closely linked to the state of its microbiome. The technological breakthrough that has enabled this understanding is high-throughput sequencing, which allows us to read DNA quickly and gather massive amounts of genomic data about the living organisms that surround us. This enables us to rapidly identify and quantify the microorganisms we cannot see, and gives us the metric which we may optimize. High-throughput sequencing didn’t exist 20 years ago. Since it’s introduction, this technology has transformed the way scientists and research labs can investigate and analyze the invisible world around and inside us. These tools, however, have not yet migrated into the hands of everyone who shapes that world, including designers who the compose rooms, buildings, and cities we live in. This is, in part, because we are still far away from fully understanding the genetic fingerprints we are gathering. Up to half of the DNA sequences in an environmental sample can’t be matched to any known organism. While we know that some microbes are pathogens, and others are necessary to live without allergies, we don’t yet know what the “optimal” human microbiome looks like. In order to start designing buildings and cities with probiotic criteria, we first need a metric of human health. This is a hard question: we know how to distinguish diseased from non-diseased, but we don’t have a measure for healthy-healthier-healthiest, nor do we have benchmark data for what the human microbiome has been throughout history. Afshinnekoo, E., Meydan, C., Chowdhury, S., Jaroudi, D., Boyer, C., Bernstein, N., … others. (2015). Geospatial resolution of human and bacterial diversity with city-scale metagenomics. 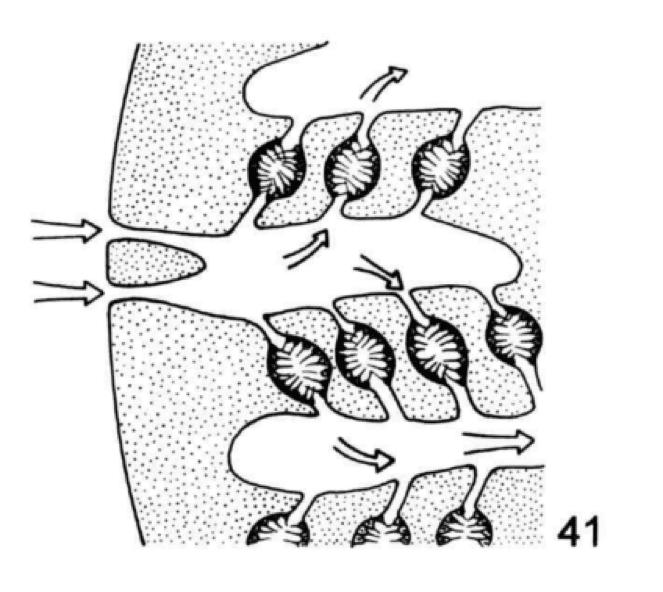 Cell Systems, 1(1), 72–87. Lax, S., Smith, D. P., Hampton-Marcell, J., Owens, S. M., Handley, K. M., Scott, N. M., … others. (2014). Longitudinal analysis of microbial interaction between humans and the indoor environment. Science, 345(6200), 1048–1052.
. But we don’t yet know what environmental microbiome to optimize towards. This interaction might perhaps be elucidated at extremes: polluted environments (such as those contaminated with industrial waste) are unfit for either agriculture or human habitation. In these cases, the byproducts of our engineering practices have yielded built environments that are highly toxic. The most extreme of these are on the Environmental Protection Agency’s (EPA) SuperFund list, a compilation of polluted sites that are a threat to human health. The purpose of the fund is to plan their remediation: either detoxification, or sequestration of the toxic material. The goal of any intervention in these sites is to decrease the level of industrial pollutants humans may come into contact with. If we can’t yet conclude what we’re optimizing for in a city, we can see clearly what we’re optimizing against at a SuperFund site. In Brooklyn, we have two SuperFund sites: Newtown Creek and the Gowanus Canal, both excellent candidates as a tractable system in which to study the relationship of design choices for microbiome optimization. We chose the Gowanus Canal as a case study, partially due to the urgency imposed by the EPA’s plans to dredge and cap the canal. This is a conventional approach, yet in the process of seeking to isolate the threatening toxic elements, the solution destroys the existing ecosystem around it. 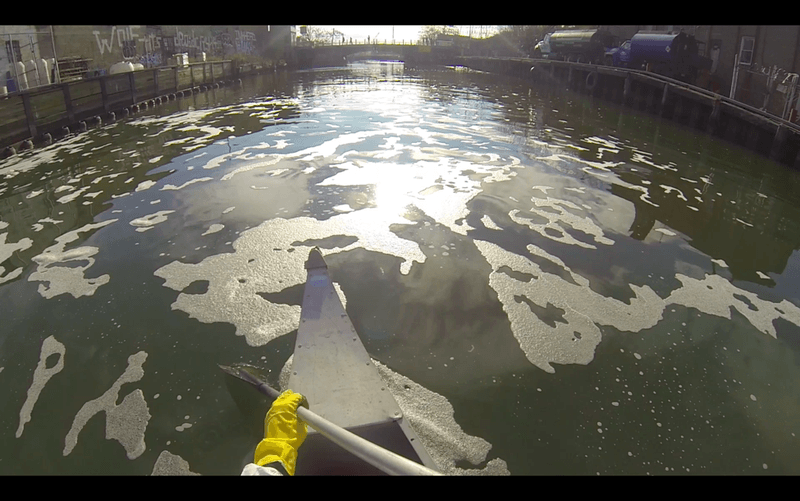 Under the hypothesis that anything living there must possess mechanisms to counteract the toxic cocktail it steeps in, we set out to document this environment slated for destruction and found that the canal includes a diverse microbial component. These microbes weren’t toxic; in fact they were degrading the overall toxicity of the canal environment, in a natural evolutionary response to the pollutants they were challenged with. In practice, this means donning hazmat suits, paddling in canoes wielding 15-ft long PVC pipes to sample the sediment. Bringing the gasoline-smelling sludge back to lab to extract DNA, sequencing it, and analyzing it to identify microbial species and their metabolic pathways. Species classification analysis showed us that the microbiome of the Canal is diverse. It is primarily anaerobic and resembles the microbiomes of natural tidal systems and the human gut. This resemblance makes sense as tide and sewage are the two main inputs to the Canal. Metabolic pathway analysis—where we search for sets of genes that, together, catalyze complex biological functions—shows that this microbiome as a whole encodes promising bioremediation functions. These include the degradation of toluene, an industrial solvent; cresol, a complex hydrocarbon; arsenic fixation. This DNA data is a molecular echo of the effect of human intervention in the Gowanus Canal: while the polluting industries—coal tar extraction, paint making, tanneries—no longer exist, their history is inscribed in the palimpsest of the extant microbes’ genomes. In terms of remediation this shows that the microbes of the Canal are already on the job. However, the rate of degradation is not sufficiently rapid for our human lifespan timescale. This offers a starting point to designing a microbially-minded approach to remediation. In this context, the focus for designers is on the degradation of toxic compounds; the metric for an “optimal” microbiome is that with the highest metabolic activity. Thus, the case study of the Gowanus Canal is a tractable one in that we know what to design for, and the understanding of the interaction between abiotic context, microbiome, and higher level organisms that can be derived from such a study is directly applicable to broader contexts. Stein, M. M., Hrusch, C. L., Gozdz, J., Igartua, C., Pivniouk, V., Murray, S. E., … others. (2016). Innate immunity and asthma risk in Amish and Hutterite farm children. New England Journal of Medicine, 375(5), 411–421. Kembel, S. W., Meadow, J. F., O’Connor, T. K., Mhuireach, G., Northcutt, D., Kline, J., … Green, J. L. (2014). Architectural design drives the biogeography of indoor bacterial communities. PloS One, 9(1), e87093.
. These efforts represent a new era in microbial stewardship, where our building materials deliberately host microbial life and thus become design elements for both unicellular and multicellular inhabitants. Poppell, E., Weisz, J., Spicer, L., Massaro, A., Hill, A., & Hill, M. (2014). Sponge heterotrophic capacity and bacterial community structure in high-and low-microbial abundance sponges. Marine Ecology, 35(4), 414–424. some microbes like the narrow channels, others the broad cavities. In nature, visible form co-evolves to nurture the microbial community that lives within it; designers must begin to consider strategies that do the same. Micro-environment assemblage: modular system for creating micro-environments of quantifiable and arbitrary complexity. Elements can be assembled in three dimensions to create architectural-scale structures. Custom cast concrete. Created as artist in residence at SVA Visible Futures Lab, currently being shown at EMW Gallery, Cambridge, Mass. My own work pursues this question with the BKBioreactor team: Ian Quate (Nelson Byrd Woltz Architects), Matthew Seibert (Landscape Metrics, City College of New York), and Christopher Mason (Weill Cornell Medicine). Building on the ways that microbial symbionts of sea sponges are selected for by the three dimensional shape of its’ cavities, we are exploring combinations of designs and materials to create pressures that select for bioremediation activity. We culture microbial samples collected from contaminated sites in custom-made bioreactors and quantitatively assay their rate of contaminant degradation given varying construction materials and designs, with the goal to find an optimal combination. The idea is not to permissively allow any microbial communities to colonize the space, but to coax the colonization of microbiomes with an optimized function. Otherwise put, the idea would be to design for directed evolution of microbial communities: altering the environment to establish selective pressures for a desired function, not just for humans but at the level of the ecosystem itself. 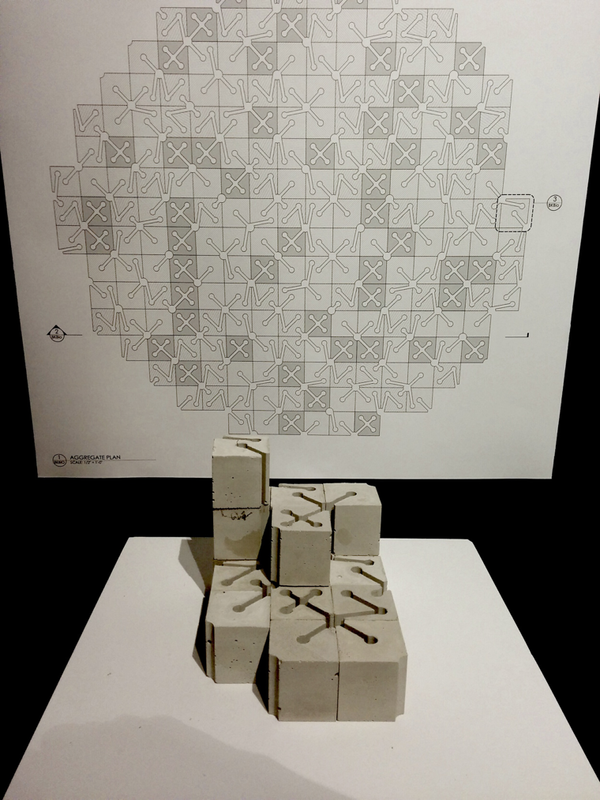 Designing the built environment with probiotic considerations can be understood as a series of pairwise interactions. Indeed, the city’s forms and materials interact with the local microbiome. The local microbiome interacts with the microbiome of local multicellular denizens (e.g., humans). These individual microbiomes interact with their hosts (e.g., you). The interaction which most enables agency through design and experimentation is the first -- that between the built environment and its microbiome. By studying each pairwise interaction individually, we draw closer to the crux of 21st century design planning: how does the built environment shape human health? To date, most of these investigations have taken place in labs and research facilities. But to effectively project their applications and effects in the real world, these ideas need to be tested and implemented at scale, in partnerships between designers and scientists, with a close eye on experimental design and rigorous controls. Thus, for those who design and build the urban landscapes around us (where 70% of human population is projected to live in by 2050) it becomes important to recognize that designers are changing the microbiome of every individual. Historically, this has been an unrecognized derivative effect, beyond the notable decrease of illnesses thanks to sewage systems. The noble ambitions of designers have often been to isolate humans from the elements around them. As a manifestation of the continuum between individual and environment, the microbiome can be used to design the interface with these elements, and should be understood as a necessary design element, constraint, and opportunity. 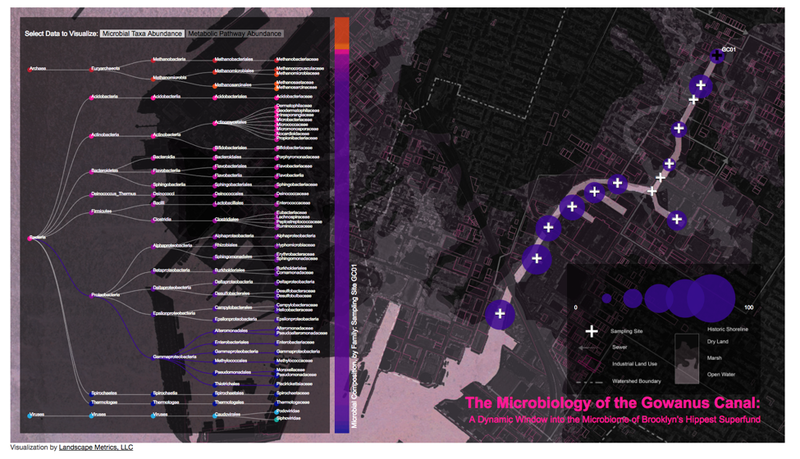 A first step is cataloguing the microbial landscapes of cities, such as what is being done by MetaSub, Holobiont Urbanism, BKBioreactor, Ocean Sampling Day, among others. Another is to experiment with bioreceptive materials incorporated into architectural elements, as BiotA Lab’s work at the Bartlett School of Architecture. Ultimately, we hope to see the distinction between city and lab blur, as devices for environmental microbiome monitoring become common and embedded, and allow for high resolution, iterative, and data-driven in urbs experimentation.